This description of the Book of Micah is from Easton's Bible Dictionary. Micah, Book of: the sixth in order of the so-called minor prophets. The superscription to this book states that the prophet exercised his office in the reigns of Jotham, Ahaz, and Hezekiah. If we reckon from the beginning of Jotham's reign to the end of Hezekiah's (B.C. 759-698), then he ministered for about fifty-nine years; but if we reckon from the death of Jotham to the accession of Hezekiah (B.C. 743-726), his ministry lasted only sixteen years. It has been noticed as remarkable that this book commences with the last words of another prophet, "Micaiah the son of Imlah" (1 Kings 22:28): "Hearken, O people, every one of you." Micah 6:1-7:20, in which Jehovah is represented as holding a controversy with his people: the whole concluding with a song of triumph at the great deliverance which the Lord will achieve for his people. The closing verse is quoted in the song of Zacharias (Luke 1:72,73). The prediction regarding the place "where Christ should be born," one of the most remarkable Messianic prophecies (Micah 5:2), is quoted in Matthew 2:6. Micah 5:2, with Matthew 2:6; John 7:42. 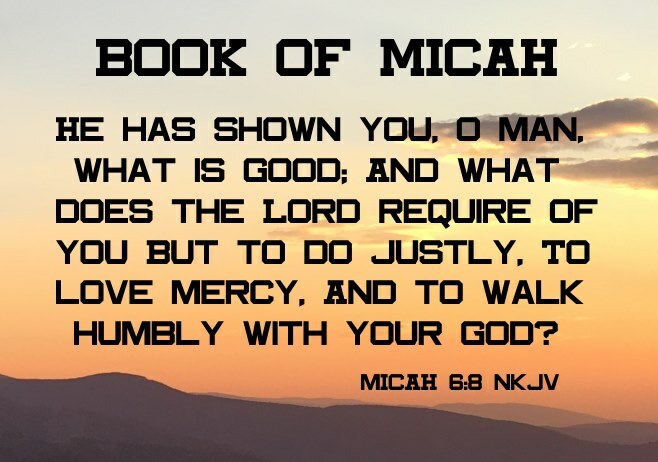 Micah 7:6, with Matthew 10:21,35,36. Micah 7:20, with Luke 1:72,73.